When I was mulling over the PrayerPoint for today, so many thoughts came to mind regarding the nose. A welcome aroma for me in the morning is coffee brewing. But there are many other equally wonderful smells–bread baking, fresh flowers, lilacs blooming, the sage and citrus fragrance from Yankee Candle. But what smells great to me doesn’t always smell great to others. I have a friend whose husband is a pastor but she can hardly go to church because she has such severe allergic reactions to all the perfumes that are so prevalent these days. I find her whole situation fascinating and I try to do what I need to do when I am in her presence so as not to trigger a reaction because I love her dearly. As you consider your nose today, thank God for the blessing of your sense of smell (as well as a place to rest your glasses!). Recognize that you might have an extra sensitive sniffer while others might be oblivious to certain things (like a sour dishrag). And consider that the fragrance of God’s love is probably received differently by different people. As you share God’s grace today, may it be a welcomed aroma! But thanks be to God, who always leads us as captives in Christ’s triumphal procession and uses us to spread the aroma of the knowledge of him everywhere. For we are to God the pleasing aroma of Christ among those who are being saved and those who are perishing. To the one we are an aroma that brings death; to the other, an aroma that brings life. And who is equal to such a task? Unlike so many, we do not peddle the word of God for profit. On the contrary, in Christ we speak before God with sincerity, as those sent from God. Have you ever read the comic strip Family Circus by Bil Keane? When I think of feet I chuckle when I think of some of the panels of Billy and his dotted line footprints as they travel through the neighborhood when he was only supposed to take something from Point A to Point B. Or I think about the Israelites on their feet wandering through the desert for 40 years. How can one never quite get anywhere in 40 years? Or Jonah getting swept of his feet and into the belly of a big fish. Where is God leading you and are your feet following or resisting? Be careful little feet where you walk. Sometimes the path you trod will take you into a completely different direction than you intended ~ for good or for bad ~ and, thankfully, no experience is wasted with God. He can use it all for His purposes. Eyes are so intriguing. They are incredibly designed – by an incredible Designer. With so much available to look at, I invite you to consider what you see, where you look, and what you are looking for. I know if I am looking for ways to be annoyed, many come within my vision in very short order. If I am looking for ways to be distracted, my eyes will surely pick up on something to distract me. If I have been hurt by something I saw, it is often quickly recalled in my mind. Blessings on your day! May you see with His loving eyes! It is so overwhelming!!! Where do I even begin? Have you found yourself so overwhelmed with the need to pray for others that you don’t even know where to start? Oftentimes during prayer, the most urgent rise to the top of your mind quickly but other times your mind is bouncing around from crisis to crisis. The most Inner Circle is our immediate family. I can pause there for a long time because I know a lot about this group of people and their needs. The next group is our extended family (our siblings and their families). Next is our small group families and those who may not be in our small groups but we are close to them. After that is super-extended family ~ those aunts and uncles and cousins “in the distance” but still on our hearts. As you consider this idea, don’t forget to consider co-workers, neighbors, missionaries, etc. Early this morning I was awake for about an hour. When it seems like I am going to be awake for a while, I start to pray. This morning, I was able to cover a lot of ground by listing people in their family groupings. I just picture a family and name everyone in the family. This list happens to include our immediate family as well as our siblings and their spouses and kids: Don, Lauren, Landon, Elizabeth, Hannah, Ernie, Kim, Nikki, Justin, Bob, Kim, Emily, Brittany, Delilah, Charles, Nancy, Jayson, Elise, Cindy, Gary, Kassie, Michele, Carrie, Shannon, Faye, Alan, Lori, Noah, Bridget, Jonah. Then I moved to the families I am in a small group with. I lifted up each person in the family by name. Even though I may have an inkling about their needs, I don’t technically need to know much because I trust God will fill in the blanks. You can tweak this idea to better suit you and your situation. 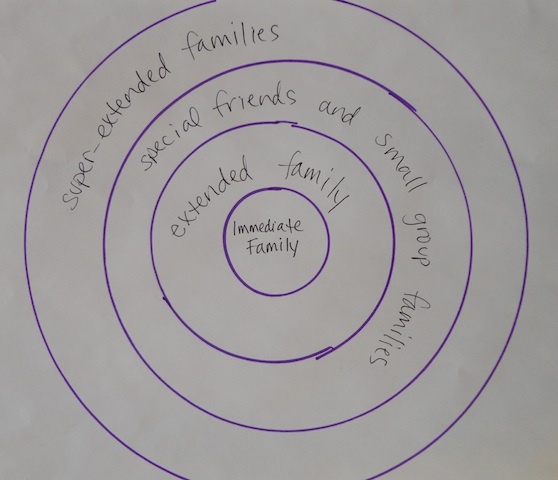 Maybe it can be a project you do with your kids or grandkids–you can each draw your circles on a clean piece of paper and fill in the blanks with people in your circle. You can even do it with a large piece of newsprint paper and photos of your targets! I love how everyone’s “targets” will look different. Get creative! I think that is one of the ways God works with His people ~ He gives us eyes and hearts for different people and people groups. I have found having a target helps me focus my aim. Of course, the idea is to pray. And once you start thinking about it this way, you will see you have a lot of work to do! Posted on February 7, 2012 February 23, 2012 Categories PrayerPointsTags families, Inner Circle, people groups, pray, prayer, PrayerPoints, target, Zig Ziglar4 Comments on It is so overwhelming!!! Where do I even begin? My guess is that when God inspired these words in Philippians, He knew that whatever one dwells on, one ends up expressing. You know how it is–whatever you ponder in your heart and mind eventually makes it to your lips. And so it is incredibly important to consider what you ponder. Do you marinate a certain frustrating encounter that ends up creating or feeding an anger and intolerance for that other person in your heart? Do you find yourself ruminating over someone’s words or actions to the point of getting really fired up about getting even or at least getting a good dig in? I hate it when I fall into that trap! If dwelling on false, lowly, wrong, impure, ugly, repulsive, imperfect, or unworthy things is tripping you up, make a conscientious choice to focus your thoughts on other things. Having a hard time doing this on your own? Ask God to help you and He certainly will! And as you express yourself, consider your words and the example they set. 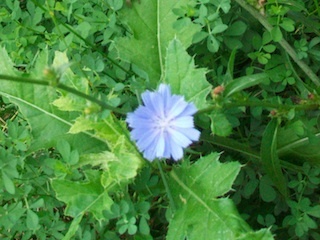 Encouraging words in this day and age are like a precious bloom amidst some weeds–so refreshing! Lord, Teach me to measure my words and to consider dwelling, truly dwelling, on Your Word alone! Posted on January 11, 2012 Categories PrayerPointsTags express yourself, God, inspired, Philippians, ponder1 Comment on Express Yourself!